Shang Rui, born in Suzhou in Jiangsu province, was a monk. His painting style was classical, and he also wrote poetry. According to the inscription, the painting imitates the brushwork of Wen Boren (1502-1575), the nephew of the famous Ming painter Wen Zhengming (1470-1559), who is known for his landscapes. 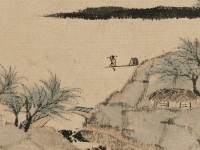 It is said that Wen Boren’s landscapes have two different styles, a ‘simple’ style and a ‘complicated’ one. His ‘complicated’ style is influenced by Wang Meng (1301-1385), who usually applies intensive cun strikes and dots to make a dense composition. Here Shang Rui seems to follow Wen Boren’s ‘complicated’ style. Purchased with the assistance of the V&A and the Friends of the Ashmolean Museum, 1978. Shang Rui, born in present-day Suzhou in Jiangsu province, was a monk. His painting style was classical, and he also wrote poetry. One Qing text treats Shang Rui and Mu Cun as two separate painters, and the date of his death is contentious. The possibilities are 1683, 1686, or after 1724.